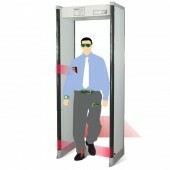 Walk through metal detector is gradually becoming a necessity nowadays with the increasing concern of security issue. The detecting technology is more and more adopted by institutions, communities as well as individuals. This exact product is a high performance standard HI-PE walk-through metal detector suitable for various security check applications, such as airport, factories, public events, hotels, supermarket and so on. Featured stable, reliable and mechanical construction and easy installation, the system is also characterized with a very high detection speed, which is up to 50ft/sec. The security system is the optimal choice as ease of use and efficient guards against hidden illegal and suspicious objects in wide range. With design for both single point and multi point location, the detector is capable of accurately locating magnetic, non-magnetic and mixed-alloy metal weapon and etc with high level of discrimination. When target detected, there will be visual and audio signal simultaneously. In case of detection of metallic mass, the detector also gives a illuminated“height on person” display to indicate the exact position of the target. In addition, it has exceptional immunity function to improve the accuracy even though in case of electrical noise, which also depends on the transit speed. Excellent unit and fast delivery. Quite easy to install following the manual. Work quite well. The walk through door is found well functioned after test as descripted. Worth every penny cost. Satisfying buy anyway. High performance and excellent discrimination. Also appreciate all the technical advice help.